Sambhu is Lord Siva. His consort is Sambhavi. 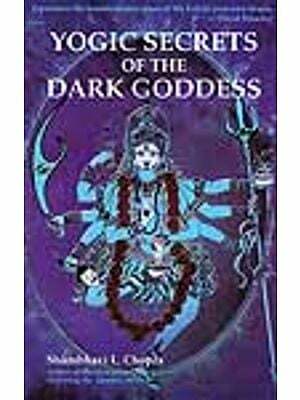 She is the goddess who grants yoga siddhi to yogis who advance in sadhana. In the Sri Vidya marga, the methods of worship of Sambhavi are called sambhavividya. We see people worshiping God uttering smabho siva sambho maha deva, hara hara maha deva. She is the deity who grants kundalini siddhi called sambhavi mudra. The joining of the bindu kala and siva kala in our body is called visva kundalini. 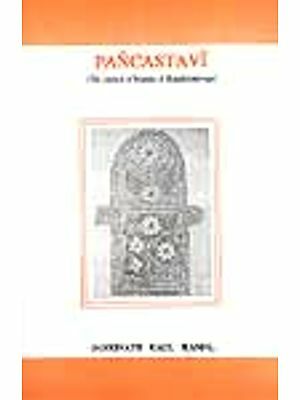 This book which begins with prana anala samyogam describes various topics such as the secret function of the navel, functioning of the surya nadi, the state of merging of intellect with cosmic consciousness. The danger of thought free state, the way to attain peace through dhyana, chittha prajna (the pinnacle of advaita jnana), brahmama satyam jagat mithya- the philosophy of advaita and dvaita states etc. are also elucidated here. 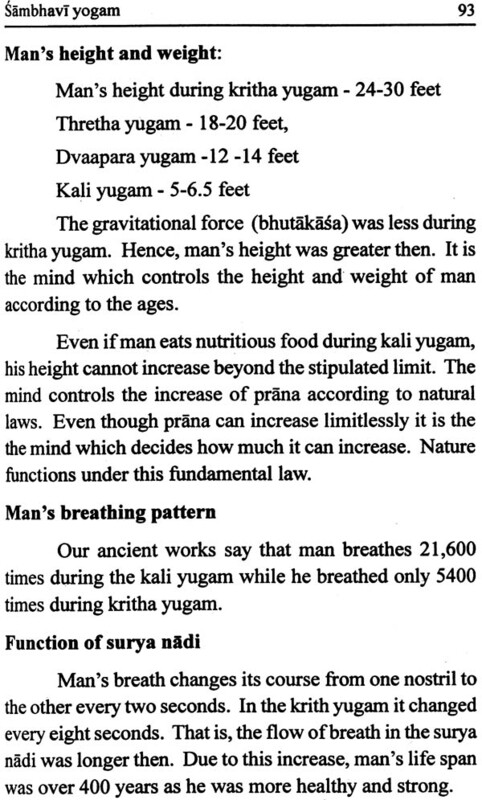 The deterioration of yoga, that was in a supreme position in the Kritha Yuga is also discussed in detail. The ability to control nature through yoga, the prana sakti that dangles in the exhalation, connections of the bhutakasa, Lord’s cosmic consciousness, Siva tanmatra that can grant Isvara kataksha, nada bindu samyuktam and the echo of the soul are thoroughly explained here. Sri. Prabodharan Sukumaran, a direct disciple of AmarakaviSiddheswara, has written this book on Sambhavi yoga, an esoteric method of reclaiming the energy that is wasted through unnecessary thoughts and using it to attain higher states of consciousness. We have all experienced paralyzing fatigue that follows a period of intense thinking. We feel as if we performed an arduous task. Sri. Prabodharan explains, based on his learning from Amarakavi that thoughts carry a small part of heat energy which is present in our muladhara for us to exist and function. When a plethora of thoughts race through our mind, this energy is dissipated and hence we experience the fatigue. The way to avoid this loss of energy is practicing what Amarakavi calls a 'vacant look', a technique where the eye does not register any visual impression on the brain. This, he claims, will reduce the number of thoughts as thoughts originate as an images in the mind. 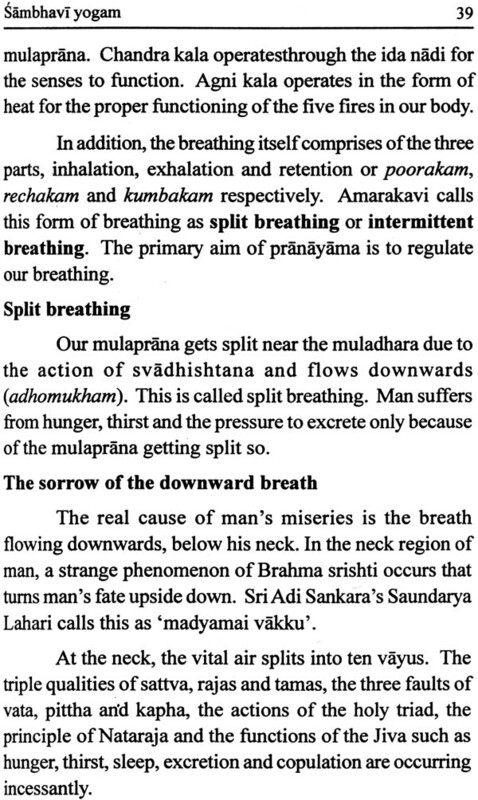 Through the practice of vacant look, one can reclaim the energy from the thought and combine it with the power of vital breath (prana), a technique he calls pranaanala-samyogam. This process will help one go beyond the limitations of time, place, maya, karma and its effects. Sri. 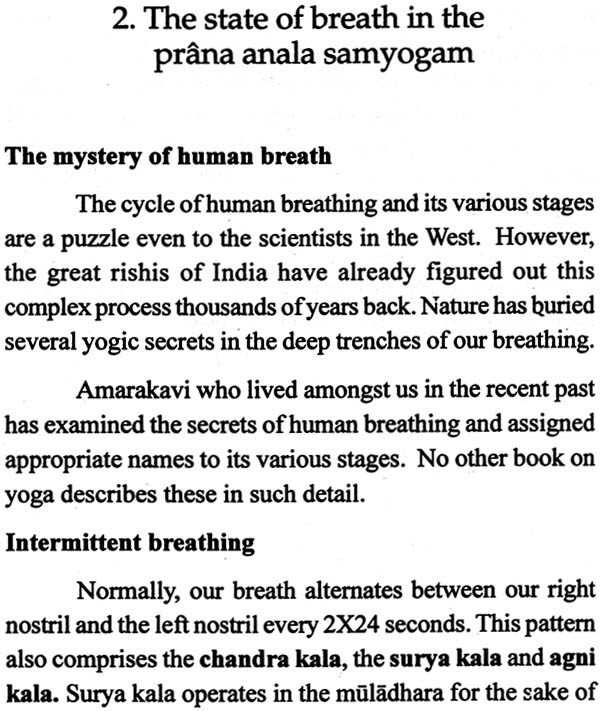 Prabodharan explains the flow of breath in humans versus four legged animals in an interesting fashion thus giving a reason for why man is a man and not an animal. Nirvikalpa Samadhi is generally considered the pinnacle of yoga sadhana. Sri. 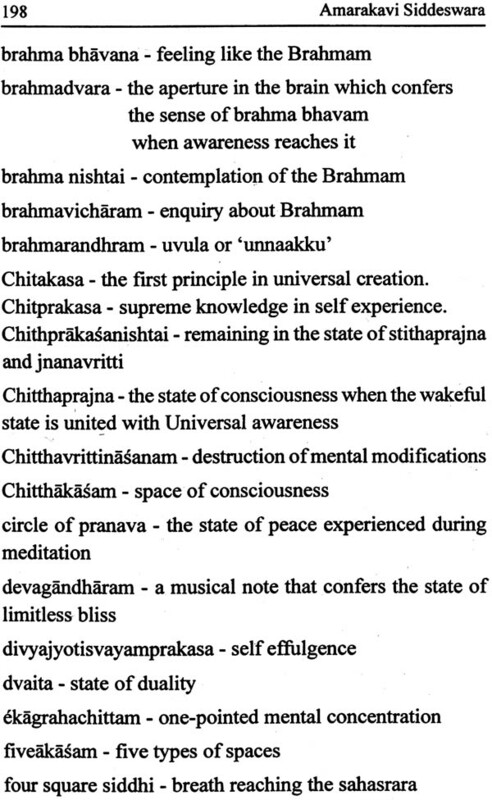 Prabodharan explains the dangers of this state and recommends that a yogi practicing SriVidya should seek the chittaprajna state - a wakeful state with universal awareness, instead. Sections on surya kala, chandra kala, agni kala and anandaspadam or waves of bliss that sweeps a yogi and deludes him into thinking that it is the ultimate state are explained well. 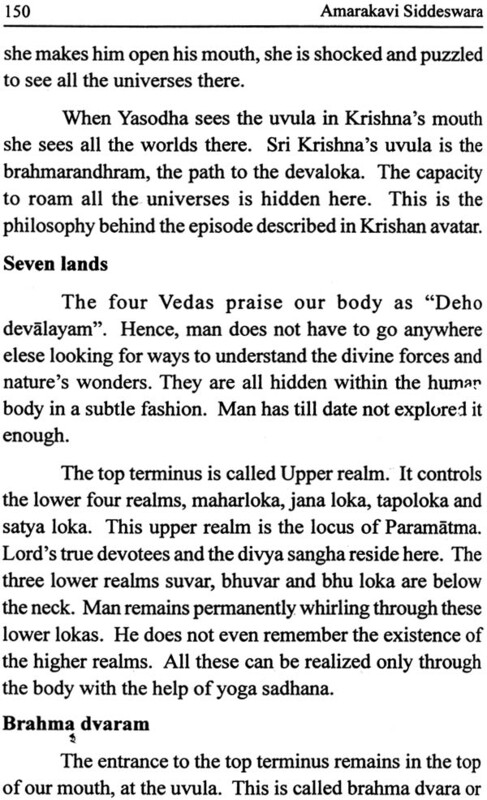 One should remember while reading some sections, especially those on the dimensions of man during various eons and the speed of earth's spin that even though these theories lack scientific proof at present, they are explained from Amarakavi 's direct experience that no one can contest. Sections on jyoti yogam, nada yogam, vaikari siddhi and kanta siddhi will help a Srividya upasaka to understand his experiences during his sadhana. As Sri. 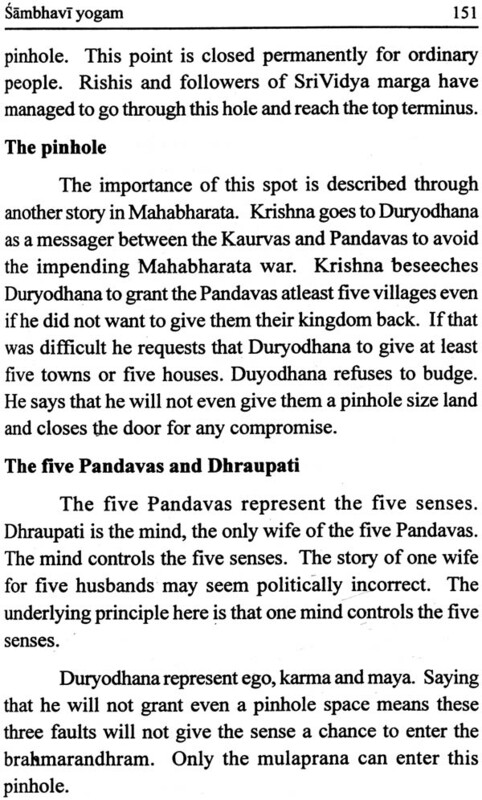 Prabodharan points out in his introduction, this book is not a text book on Srividya upasana, it is a guide book that would help an upasaka understand his experience and walk in the path of his sadhana cautiously. It is my sincere wish that all true seekers of wisdom should buy this book and benefit from it. We cannot fly in space and control the space principle. It thus becomes clear to us that nature has not hidden any secrets in space. but on earth in an. The five elements are not present in space but are on the earth in an easily identifiable fashion. The five elements and their combinations have not been identified so far anywhere else in the universe other than on earth. Scientists are examining whether another earth with such combinations exists somewhere in the universe. They are also exploring the possibility of creating such an atmosphere in some other planet so that man may colonize it in the future. This universe, made up of the five elements, has been present since time immemorial. In fact, the universes were created much before man came into existence. It is a ~ wonder that all the principles of nature's creation are hidden within the man like a seed that contains a mighty tree within it. This is Lord's greatest mystery. When we slowly unravel the knots placed on our body's functioning, we begin to understand the great truth of how brahma srishti (Brahma's creation) is functioning so precisely within us. This is how the intellect raises the ' divinity within us with the help of awareness and realizes its oneness with Brahman, the creator. Amarakavi Siddheswara's divine books help us in this pursuit of mental clarity and true knowledge. The ultimate goal of yoga and austerities is to attain wisdom. That is, realizing the cosmic consciousness through self awareness. Man cannot achieve freedom from the whirlpool of brahma srishti unless he possesses wisdom. Our ancestors have identified several ways in which this wisdom can be achieved. Some are happy with devotion; some prefer ashtanga yoga while some others say that advaitic inquiry is the best means. Several maharishis and siddhas have spent several hundred of years in austerities to bring this wisdom to the common man. Their main expectation was that if people are aware of yoga and its various steps, first they will be clear about the goal to reach when they begin their practices. We should remember another important point here. We are people with families. We tackle several problems and miseries in our daily life. It is not correct to expect to achieve, in this birth itself, all the accomplishments the Siddhas and Maharishis took several years to achieve. Good fortune should continue in a man's life over several births for this to happen. One should have a long life span. All the planetary positions should be favorable. Not only that, we should live an exemplary life. Only then will the Siddhas bless us with their grace and help us in our yoga sadhana. To top it all, God's grace should fall upon us. Only if all these requirements are met one can progress in yoga and rise up. Unfortunately, these days the religious leaders and heads of religious organizations who should be teaching people all the above mentioned facts are themselves unable to go deep into meditation. 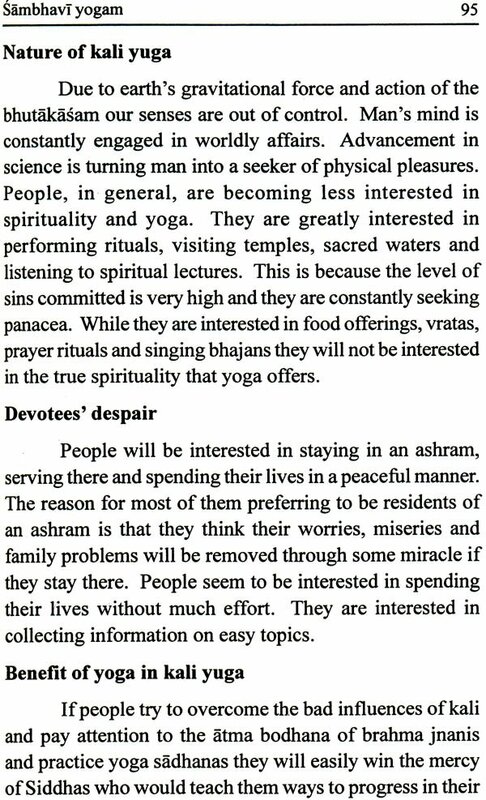 How can they, who cannot even go to the level of prathyahara, go deep into the dhyana stage? They are completely immersed in rituals and rites; they are unable to release themselves from the clutches of chittha vritti and wordly knowledge. They are unable to reach the state of mano nasanam. One should remember that unless the state of prathyahara is crossed one cannot cross the dharana and dhyana. The state of dhyana is equivalent to nishtai. It is the state of yoga nidra. The benefit of dhyana is to attain the jnanadrishti or the capacity to perceive the past, present and the future. Generally people blindly praise someone if they m him a lot. They will beat anyone who talks ill of him. Sue people, even if they are spiritual, are at the apex of ego. These days all the efforts in yoga have become so chea People are not motivated to seek the truth or explore natur sincerely. Sambhu is Lord Siva. His consort is Sambhavi. Sh is the goddess who grants yoga siddhi to yogis who advance in sadhana. 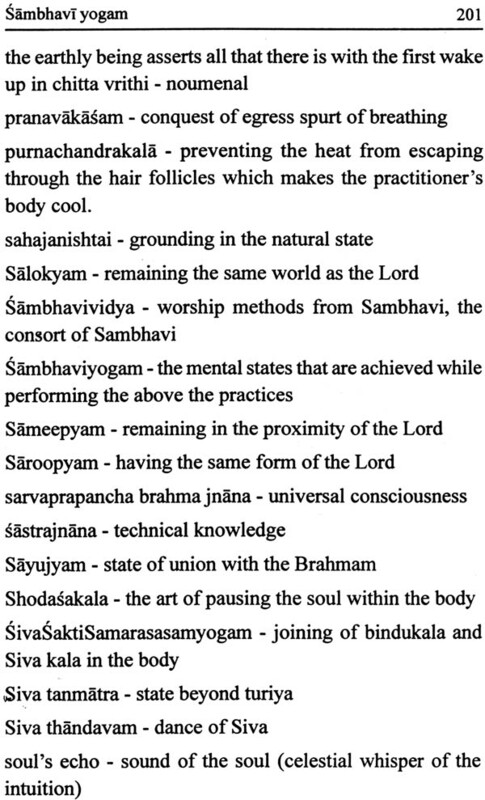 In the SriVidya marga, the methods of worship of Sambhavi are called sambhavi vidya. We see people worshiping God uttering sambho siva sambho, sambb maha deva, hara hara maha deva. She is the deity who grants the kundalini siddh called sambhavi mudra. The joining of the bindu kala and siva kala in our body is called sivasakti samaras samyogam. This technique of sambhavi vidya is called visva kundalini. Maharishis and brahmarishis of yore have gone deep into SriVidya yoga marga and identified several techniques such as sambhavi vidya, sambhavi mudra etc. 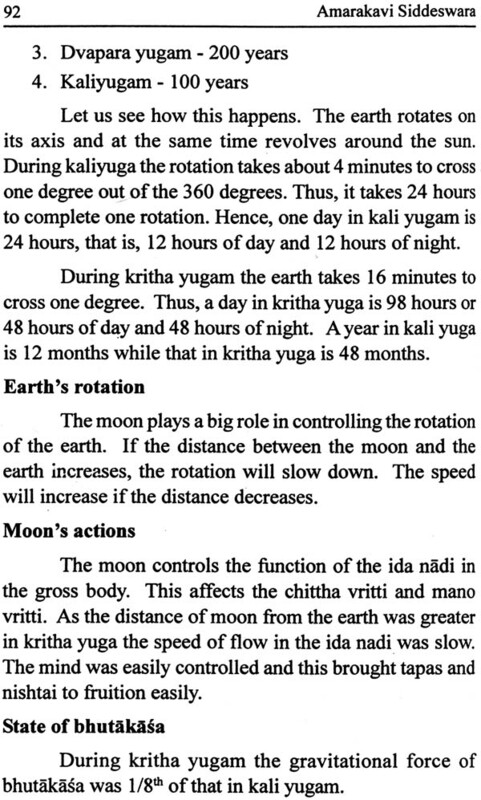 However, these techniques are mentioned only as a short section in books on yoga and that too only in a few Sanskrit yoga books. Amarakavi Siddhesvara has examined the SriVidya yoga marga deeply and in his 40th year realized the greatness of the sambhavi vidya through personal experience. The goal of this vidya is to join the jyoti yoga and nada yoga together. This book explains how to achieve this goal successfully. 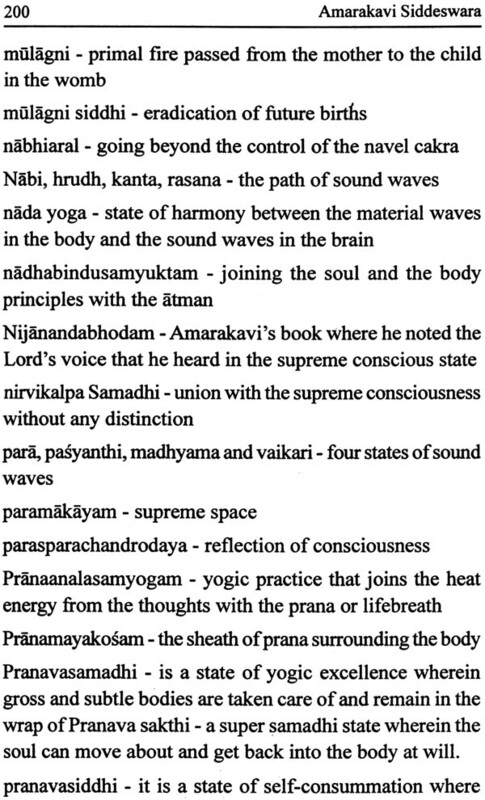 This book which begins with prana anala samyogam describes various topics such as the secret functions of the navel, functioning of the surya nadi, the state of merging of intellect with cosmic consciousness. The danger of thought-free state, the way to attain peace through dhyana, chittha prajna (the pinnacle of advaita jnana), brahmam satyam jagat mithya - the philosophy of advaitic and dvaitic states etc. are also elucidated here. 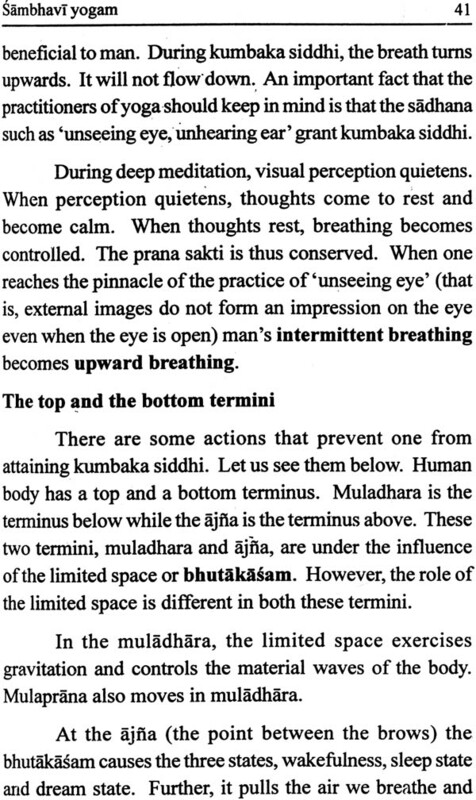 The deterioration of yoga, which was in a supreme position in the Kritha Yuga, is also discussed in detail. The ability to control nature through yoga, the prana sakti that dangles in the exhalation, connections of the bhutakasa, Lord's cosmic consciousness, Siva tanmatra that can grant Isvara kataksha, nada bindu samyuktam and the echo of the soul are thoroughly explained here. Sambho Siva Sarnbho! Sambho Mahadeva! Harahara Mahadeva! Praise to Isvara kataksham! Praise to the Lord's grace! Praise to the lotus feet of Amarakavi Siddhesvara ! !